Humans are social creatures. Personal connection with our community is important for our mental health and social development. One of the most harmful aspects of our modern consumer culture is the trend towards selfishness and isolation from ones neighbors. This disconnection from our local communities and it’s replacement by impersonal electronic social networks creates a world of misunderstanding and insular and isolated social groups. This is not a healthy way for social primates like us to live. There are a myriad of ways in with one can reconnect with and serve their communities. One of the ways that I have been called to help has been to attend demonstrations and protests to support the local social justice movement by providing medical aid to the demonstrators. This is obviously not the only way to help your community, but one method in a variety of methods and just one of the many causes that need to be supported in order to create a healthy and safe world. While it is true that the amount of work that we must do as a society in order to create a better world is seemingly endless, just the act of becoming involved has wide-ranging benefits to your community and you personally. With that in mind I would like to encourage you all to become involved with your community in whatever way you are able to. To that end I would like to share a few blog posts over the next few months about ways of serving and assisting your local communities. This first one with be a break down of the equipment that I take out into the street with me. 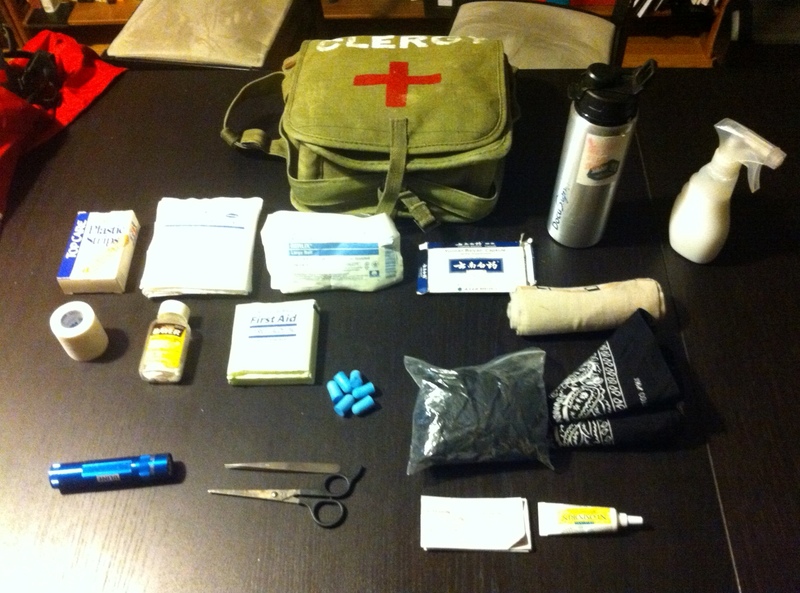 The photo below is my present street medic kit that I take out into the demonstrations. It has been evolving as I’ve been getting more time on the ground. The first night I went out the kit was bare bones and pretty incomplete but it’s been growing and filling out over time. .Each piece of equipment has a bit of a story that goes along with it. As I was packing it the other night I realized that some of them needed to be told. The jacket on the left is one of the newest pieces of protective equipment that I’ve added to the kit. We decided it was necessary for a few different reasons. The most obvious reason for the jacket is for warmth and visibility. Demonstrations and actions can happen at any given time, day or night, and medical assistance might be needed at any time, and the bright and clearly marked jackets along with our medical bags and marked red cross armbands makes it easy for someone who needs aid to find us. Generally speaking though, the worst brutality and violence from the police comes at night. 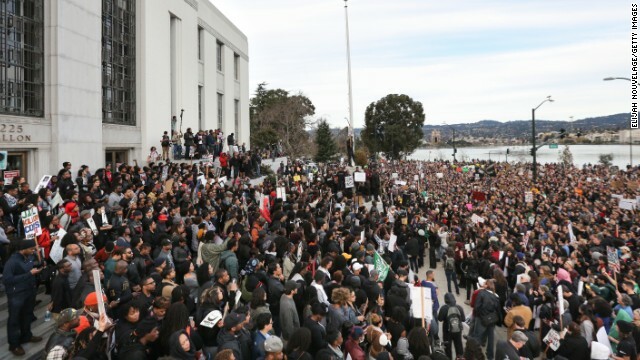 This is when there aren’t as many eyes on police actions and not as many people on the street to witness or get caught in the crossfire. The jackets not only make it clear to demonstrators where we are, but it also is very visible to the police. Much of our job as street medics is to put ourselves in the line of fire in order to aid people who have already been injured by the police. I am hopeful that being marked as a medic and as clergy will make it clear to the law enforcement officers that we are not a threat to them and we are there to assist with public safety. Maybe this will prevent them from targeting us as we do our jobs or maybe not, I have seen and heard mixed reports on that. I look at it this way, either it will prevent them from taking a shot at us, or there will be hopefully be video footage of them shooting a clearly marked member of the clergy. The gas mask is a new piece of equipment as well, a gift from a friend and ally. It’s use is self-evident. Tear gas, although prohibited by various international agreements, is commonly used by law enforcement on US citizens. I honestly never thought that I would feel the need to own a gas mask marked with a red cross and clergy, but here we are. Before I had the gas mask I used a pair of ski goggles and carried a zip lock bag with bandanas that had been soaked in a 50/50 solution of vinegar and water. I still carry those on me in order to give out to people when they need them. The most important reason to have at least some sort of defense against tear gas and pepper spray is that if you are going to be able to be effective in an environment where tear gas is deployed, you often need to get to injured people who are in the middle of it. The next thing in the picture is my helmet. This one is a ski helmet, light weight and able to take at least one good shot from a rubber bullet or tear gas canister. Some of the worst injuries that you are going to deal with are a the result of a head shot or neck shot with a “non lethal” projectile or tear gas canister, or getting struck in the head with a baton., so it’s essential that you don’t end up on the receiving end of one of these injuries while you are tending another. This is why it is crucially important that you wear some sort of helmet if you are heading into a zone where projectiles are being fired or the police line is aggressively assaulting the demonstrators. Protecting your head can be the difference between coming home bruised and spending the night in the ER. The items inside my medical bag are pretty standard with a couple of items specific to working demonstrations. The basic supplies are; various sized gauze pads and rolls of gauze, medical tape, pain reliever, band aids, alcohol wipes, neosporin ointment, non latex gloves, tweezers, scissors, flashlight and fresh water. The non standard supplies are Yunnan Baiyao capsules (a Chinese herbal powder that stops bleeding), the previously mentioned vinegar and water-soaked bandanas (for tear gas), a small spray bottle filled with a 50/50 mix of Maloxx and water (for neutralizing the effects of both tear gas and pepper spray), and ear plugs (to negate the effects of LRAD’s (long-range acoustic devices, basically weaponized sound)). This is all held in a WW2 era Belgian paratroopers medic bag which I got at an army surplus store. In truth my medical bag is a little small for what I’m using it for and I received a much newer and larger bag when I received the donation of the gas mask, but I find my little bag charming and comfortable so I am setting up the new bag with supplies and keeping it on hand for others that inevitably end up going out in the streets with us. The final piece of equipment that I bring along with me is in some ways the most important one. 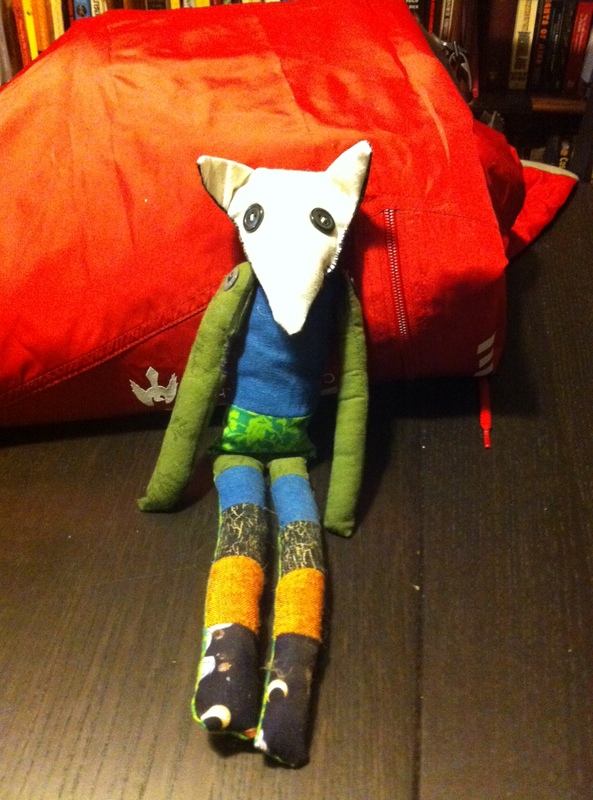 This is the stuffed fox that my youngest daughter made for me about 3 years ago. During the time since it was made and given to me, the fox has had a prominent place on my ancestors altar in my home. I say it’s one of most important things that I carry on me for a couple of reasons. First of all, it’s a piece of magic and love made by my daughter, so not only does it have her love and energy imbued into it, but it serves as a reminder of why I am out there, to create a better world for our descendants. Also, it is a component of my ancestor’s altar, and there is great value in keeping close the connection between our ancestors, those that paved the path we walk upon today with their blood and our descendents, whom we spend our lives and blood to create a safe and viable path ahead for. These struggles for freedom from oppression, social and environmental justice and a better world for everyone did not start with us and will not end with us. Those that came before us fought these same battles and those that follow us will fight them too. There is no finish line here and it is our obligation to continue holding back the tide of authoritarianism and injustice lest we allow it to drown us all. I would like to end this with one more thought that I feel is crucial for activist pagans like myself to keep in mind. Some of the main advantages that we have as pagans is the use of magic and our connections to the gods. We need to not be afraid to use these tools to our advantage. I will not go out into a dangerous environment without making offerings to my gods, ancestors and spirit allies and when I do head out there, I am using every protective magic I have available to me. Our spiritual allies want to aid us, they are as invested in us and the world we are creating as we are. Acknowledging this fact, asking for aid, and thanking them when we receive it is part of the relationship between worlds that we are part of. We are witches, druids, priests and spirit workers. We have a host of allies and methods of subtly shifting the world around us, we must take advantage of this and use it to make ourselves more effective and keep us safe in our battles. The actions that we take right now matter, let’s make them count for something and join our communities in the struggle that surrounds us all. Good food for thought here, though it is a truly horrifying world in which we live. There is courage here, and a fierce desire to make a difference, and to drive back some of the hatred and mindless darkness that is devouring our collective soul. How about Sionnach for the fox? Thanks for writing this post, the importance of supporting the community is something I’ve been thinking about and wanting to be more involved in. 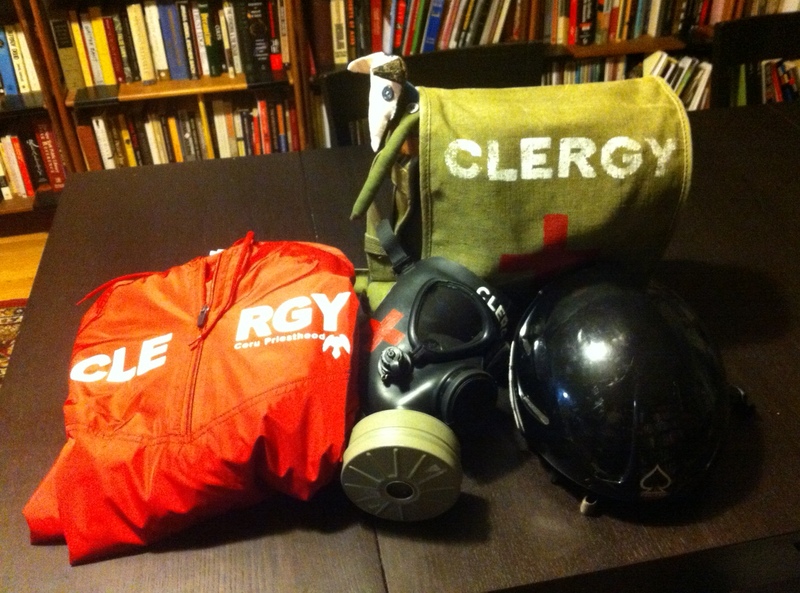 “I honestly never thought that I would feel the need to own a gas mask marked with a red cross and clergy, but here we are.” Here we are, indeed. Your matter-of-fact brevity and willingness to endure and give voice to this kind of experience for the benefit of community is admirable. Please ask your daughter if she likes the name Vox the Fox, a little friend who brings comfort and tells stories that need to be told. Thank you for your comments everyone. I encourage everyone to find something that they feel strongly about in their communities and help in whatever way you can. Even small actions help more than you would expect. I’m going to collect all the suggestions for fox names and give them to my daughter and let her decide which one we should use. I’ll update the blog when we come up with one. There are many kinds of fighting, struggling and facing anger. I do not see myself in such a place but can honor someone who does. Thank you for sharing the ways you connect with, defend, and otherwise tend your community. ‘Tis inspiring. That opening paragraph is full of spot-on statements. Connecting with others in real-time when many are closed off and zoned in to their devices requires extra work. When I walk about and see people willing to connect, I often find myself connecting with people living as a cast-offs from modern society, homeless people, mostly. My energy field is open, and people accustomed to being ignored tend to respond to whatever it is I’m radiating. It feels good to offer food and aid and kindness to other outcasts. It nourishes me every bit as much as I hope it nourishes them, a mutually beneficial exchange. I wonder if your daughter would like the name Doc Maalox, the Boxing Fox. My alter-ego, King Forgetful, a character I invented when I taught preschool, does humbly offer it to her for her consideration.